For my money, this is the ultimate vacation, read-anywhere, pick-up-and-put-down book. It also has a nearly universal appeal, so it's also the ultimate gift book. Many of these very short, true stories have Twilight Zone-like eeriness to them, and every story gives you something unexpected, whether that is a gut-wrenching poignancy or an episode of laugh-out-loud humor. 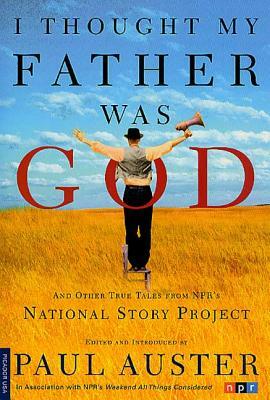 The true-life stories in this unique collection provide "a window into the American mind and heart" (The Daily News). One hundred and eighty voices - male and female, young and old, from all walks of life and all over the country - talk intimately to the reader. Combining great humor and pathos this remarkable selection of stories from the thousands submitted to NPR's Weekend All Things Considered National Story Project gives the reader a glimpse of America's soul in all its diversity. Paul Auster is the bestselling author of Winter Journal, Sunset Park, Invisible, The Book of Illusions, and The New York Trilogy, among many other works. He has been awarded the Prince of Asturias Prize for Literature, the Prix Médicis Étranger, the Independent Spirit Award, and the Premio Napoli. He is a member of the American Academy of Arts and Letters, the American Academy of Arts and Sciences, and a Commandeur de l'Ordre des Arts et des Lettres. He lives in Brooklyn, New York.